Grey London takes an unconventional approach for Vodafone U.K., focusing on British emergency responders, more than three-quarters of whom, we're told, use the telecom's services. 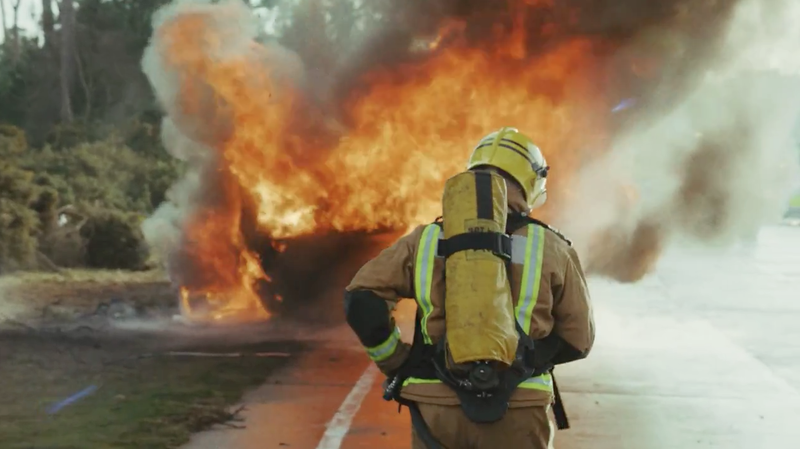 "The Call," a riveting 60-second spot that feels almost like a PSA, eschews actors and CGI, using footage of real firefighters and burning cars. (It's not an actual crash, but a realistic scene staged by director Marcus Soderlund of Academy Films specifically for the commercial.) It features an understatedly effective voiceover by Grey creative director Vicki Maguire, who helped create the spot, playing the part of a first responder's wife. Her lines are simple but stirring: "People say, 'But don't you worry?' And I go, 'Well, no, it's just what they do. It's what they're trained to do. They're used to it. And so are you.' But even after 27 years, you still want a call or a text. It's never, 'I love you. I'm OK. I'm safe.' It's just, 'What's for dinner?' " She closes by gently chiding, "Daft beggar," and her concern and devotion to her partner shine through. "The repositioning of a network away from the handset and the fun of the Internet—dancing cats, animals on wheels, that kind of shizzle—to a strength of the network is a brave one," Maguire tells Adweek. Might some viewers take umbrage at this approach to selling phone service? "It's an honest and transparent link," Maguire says. "The idea and subsequent spot come off an independently substantiated fact: 77 percent of our emergency services use Vodafone. It's brave and bucks the category norm, but it comes from a truth. Why hide that?" Maguire nailed the voiceover in a single take, basing her performance on men and women she's known whose partners have dangerous jobs. "I've always thought they are as heroic as their partners on the front line," she says. "The VO is an amalgamation of those conversations." She adds, "We fully expected to re-record" the narration, but "the more we worked on the ad, the more the team loved the voice. We showed it to real firemen, and they were like, 'Yep, that's the wife!' I was chuffed!" This is Grey London's first work for Vodafone U.K. since winning a place on the U.K. account. An earlier Grey spot for Vodafone, "The Kiss," which aired in some European markets, won two bronze Lions at Cannes last year.